Here is another egg I made last Easter. It my first time experimenting with moulds and soft centres. 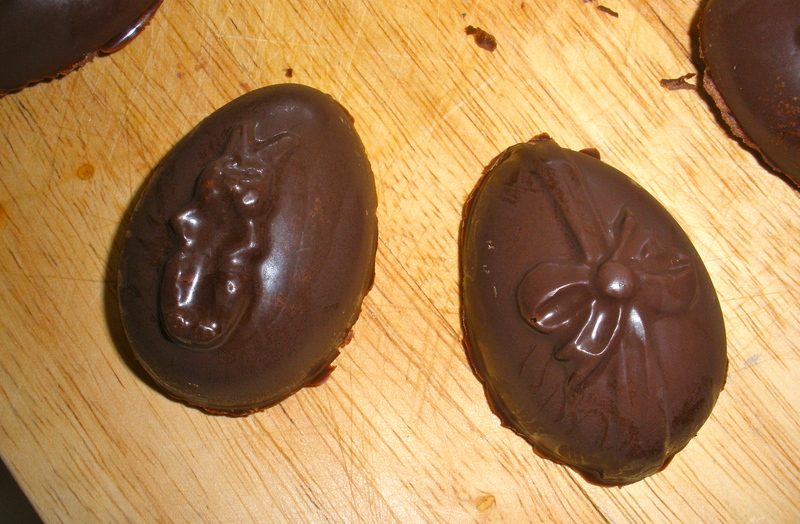 It’s a simple recipe of a chocolate and peppermint centred Easter egg. Melt 125g of dark chocolate in a microwave safe bowl in 20 second bursts, stirring well between bursts. 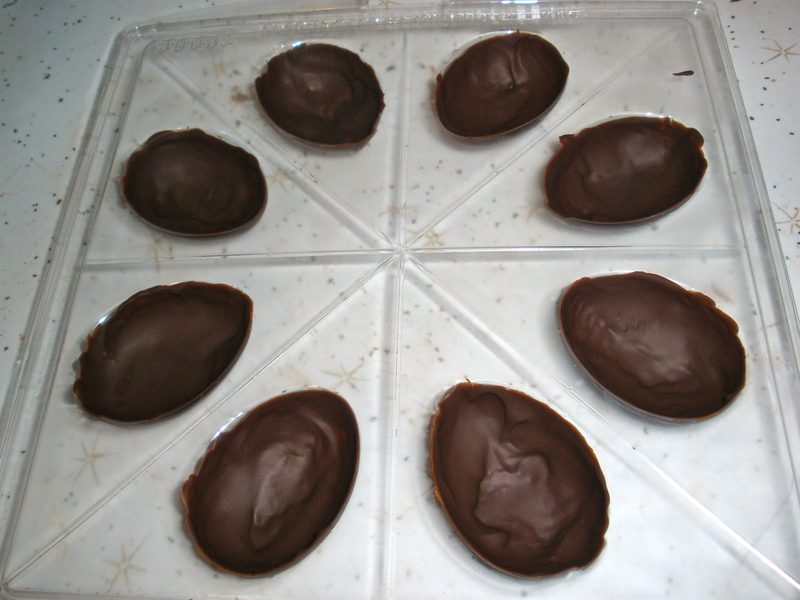 Use a small pastry brush to spread a thin layer of the melted chocolate over the inside of 12 medium easter egg moulds. Reserve the remaining chocolate for later. Place the moulds in the fridge until set. Melt remaining chocolate and cream in a microwave safe bowl in 20 second bursts, stirring well between bursts until smooth. 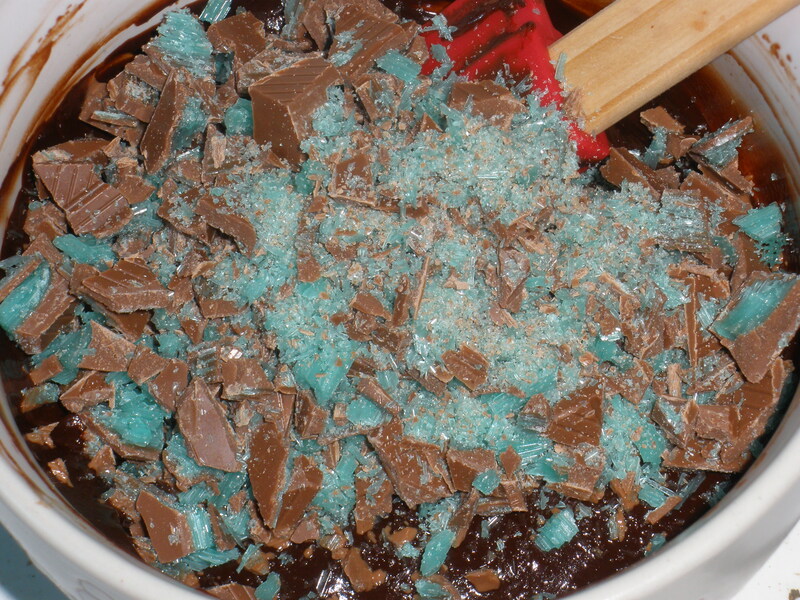 Stir in Peppermint Crisp and set aside for 15 minutes, or until starting to set. Divide filling among egg shell halves. Refrigerate until set. Melt reserved chocolate and brush over the backs of the egg shell halves to enclose. Refrigerate until set. Upturn mould onto a flat surface and carefully remove eggs by very gently squeezing the moulds. For the past two Christmases I have made a kind of hamper for family and friends made up of a few food treats that I made. The first year I didn’t bother to test the new recipes, so it was a bit of a mixed bag results wise. That year there were two stand out items; Raspberry Rocky Road and Cinnamon Crusted Macadamias. It was also the first time I had any success with egg whites. My lack of success until then was likely due in part to being unaware that I needed to use fresh, room temperature eggs. The crust is a beautiful cinnamon flavoured meringue that has a nice crunch when you bite into it. Preheat oven to 180C and line a large roasting pan with baking paper. Using an electric mixer, beat egg whites and salt in a bowl until soft peaks form. Add caster sugar 1 tablespoon at a time, beating constantly until well combined. Fold demerara sugar and cinnamon into meringue. Add macadamia nuts and stir until well combined. Spread the mixture over the base of the prepared pan. 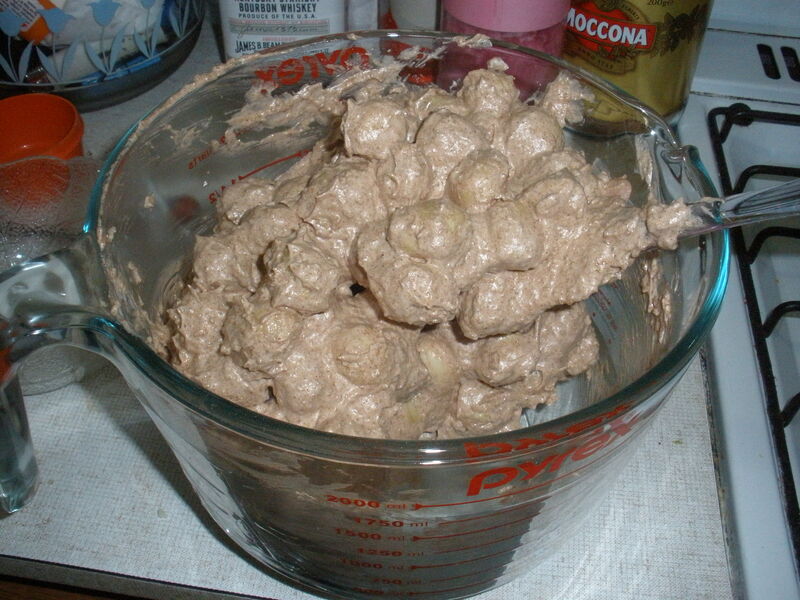 Bake for 10 minutes, then stir with a large metal spoon to break up the mixture. Bake for a further 20 minutes, stirring every 5 – 8 minutes, or until the cinnamon/sugar crust feels dry. 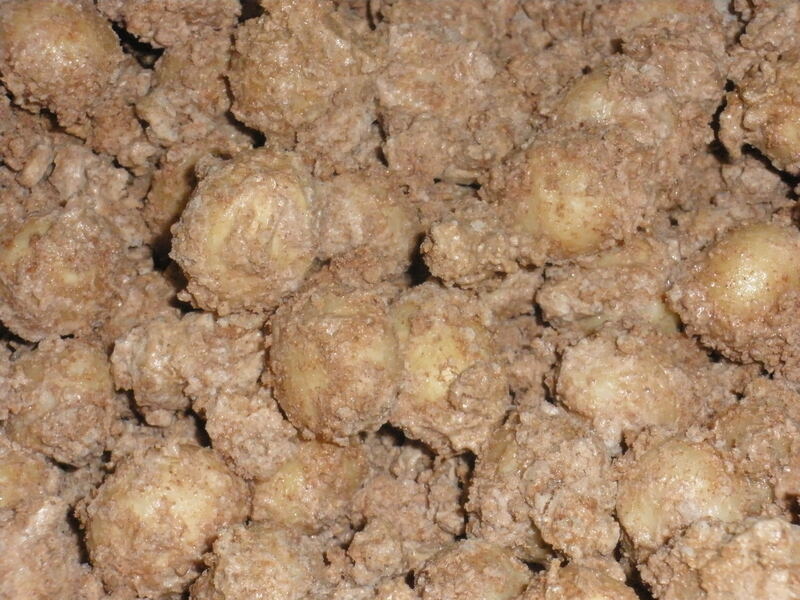 It’s very important to stir, otherwise the coating will fall off the nuts when cooled. 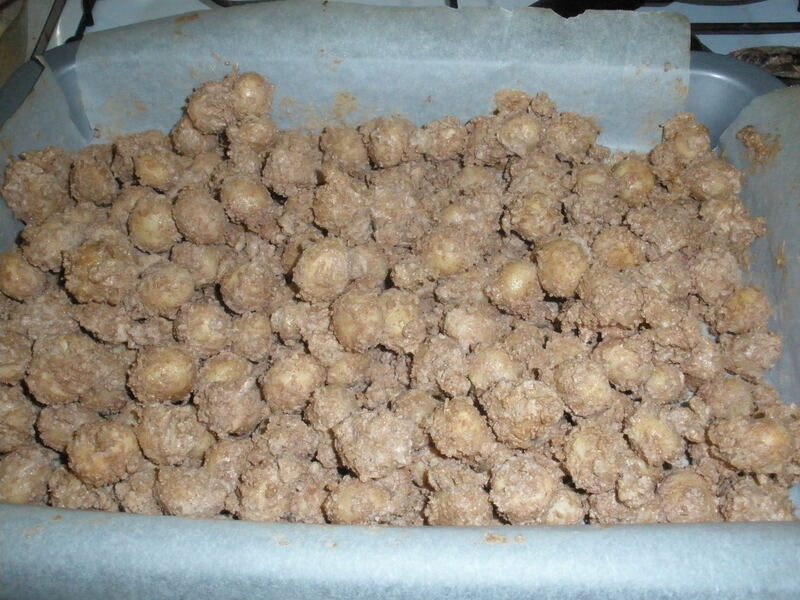 Allow the nuts to cool completely in the pan. Break up to serve.